The startup developed from a chance meeting at a party between Washington and James Livengood, Radicle’s Production Director. With experience creating farms from the ground up both in the United States and Africa, Washington seemed the logical choice to head up Radicle’s team. A greenhouse management contract with the folks at Garden State Urban Farms in New Jersey ignited production. 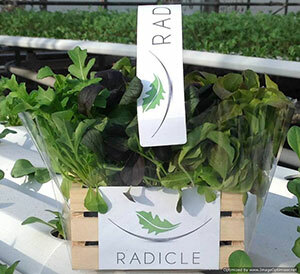 Funded by a few investors and private funds, Radicle offers several varieties of living salads to the Brooklyn area. Their high-end product has attracted restaurants, caterers and grocery stores alike. Chef-friendly produce such as arugula, Japanese peppergrass and Shanghai spinach are sold with roots attached in recycled packaging for immediate consumption or long term planting in the garden. By narrowing their focus and, as Washington states, “doing one thing well,” Radicle is enjoying early growth and branding success. With six core employees and an aggregated network of local farmers, Radicle’s hydroponic greenhouses provide customers with produce year round. Radicle manages 10,000 square feet of greenhouse space as well as 7,000 square feet of outdoor grow space. With approximately 600-1,000 pounds of produce to sell every week, the company distributes mostly to the wholesale market, but has plans to develop its retail market share. Using rehabilitated greenhouses, new technology and aggregated produce from local farmers has helped reduced Radicle’s overheads, essential in building a sustainable business according to Washington. Constant research and development has given Radicle its edge in the market, but Washington believes the trend towards local foods is growing with enough market share for everyone that wants it. “All the growth in the sector is in private brands and that is something that is truly unique to our industry. What that means is there are a lot of opportunities for small regional brands to grow and develop. There doesn’t need to be competition for that because it’s growing so quickly. We definitely want to collaborate not compete with people in our market and carve out a space with this living salad product,” he says.